This feature is used to add, delete, or move different planes (e.g. back, action, front). It is recommended that you use the "template levels" since doing so will prevent the you from having to use this feature. Note: In Gruntz, there are no levels that have a "front" plane. Only Area 4 (High on Sweetz), Area 5 (High Rollerz), and Area 8 (Gruntz in Space) use this feature to create a parallaxing background plane. This will bring up a dialog box "Load Image Set Resource", that will allow you to add an Image Set (or Sets) other than those specifically targetted for the graphics set you are working with. This would primarily be used to use EyeCandy objects from a different area to be used in your Custom Level. The following fields are used in World Properties for "Gruntz". Name: - This is where the user enters the level number. (e.g. "Gruntz - Level 5"). The game uses the level number to determine which area specific images to load into memory (e.g. Rocky Roadz, Gruntziclez, etc). Important! Make sure that you are using the appropriate Level number for your custom level. Author: - This is where you may enter your own name (or 'handle'). The default value is "Monolith Productions, Inc.". Birth: - This field is filled in automatically when a Custom Level is SAVEd. Start X: - This field contains the horizontal (X) axis pixel address to be centered on the opening screen when the Custom Level is loaded. Start Y: - This field contains the vertical (Y) axis pixel address to be centered on the opening screen when the Custom Level is loaded. This should be approximately the coordinatez of the first Grunt that the solver should work with. Rez File: - This field specifies the location of the Gruntz.rez file. The default for the template levels is "C:\Games\Gruntz\Gruntz.rez". If you change the default installation directory for Gruntz, then you will need to update the path in this field for your custom levels. 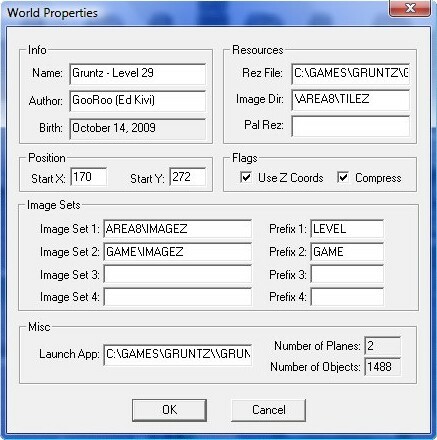 Image Dir: - This field specifies the location of the image files; set by the Gruntz Level editor based upon the "Name:" value, e.g. "\AREA#\TILEZ". Image Set 1: - This field specifies the location of the images unique to this graphics set. Prefix 1: - This field should contain "LEVEL". Image Set 2: - This field specifies the location of the images that are 'global' to the game of Gruntz. Prefix 2: - This field should contain "GAME". Image Set 3: - This field specifies the location of additional images (usually blank). Prefix 3: - This field is normally blank. Image Set 4: - This field specifies the location of additional images (usually blank). Prefix 4: - This field is normally blank. Launch App: - This field specifies the location of the Gruntz.exe. The default for the template levels is "C:\Games\Gruntz\Gruntz.exe". If you change the default installation directory for Gruntz, then you will need to update the path in this field for your custom levels. Number of planes: - This field is maintained by the Gruntz Level Editor; normal value is 1 (2 for Areas 4 (High on Sweetz), 5 (High Rollerz), and 8 (Gruntz in Space)). Number of objects: - This field is maintained by the Gruntz Level Editor. It contains the number of items that have logics associated with them.